In my copy’s booklet (I have the French edition, “Chants de l’extase”), there’s a translation botch by which the German “alle Stücke, die aus handschriftlichen Ausgaben musiziert werden, basieren auf direkten Konsultationen mit Wiesbaden MS, eingerichtet von Barbara Thornton” becomes “All pieces performed from diplomatic editions based on direct consultation with Wiesbaden Ms, prepared by Barbara Thornton”. How did “diplomacy” get involved with that, I don’t know. No, I take that back, I do know: it’s probably “diplomatic” in the now rare sense of “related to diplomatics” (not diplomacy), which are “the science of deciphering old official documents, as charters, and of determining their authenticity, age, or the like”. But really, it should not have been “diplomatic, but “manuscript” editions (and although the German is a bit ambiguous there, it should have been preceded by “the” – with the implication that not ALL the pieces performed on this disc come from that manuscript edition, but those that come from a manuscript edition come from the Wiesbaden manuscript – and followed by “are” based, because in German “basieren” is the verb at present tense, “are based”). Of course, we don’t know how the sisters of the Rupertsberg monastery in Bingen sung these compositions from their famous abbess, aka “the Sibyl of the Rhine”, nor by which instrumental ensemble they were accompanied or even if they were accompanied by instruments. When you look at the few manuscript scores of Hildegard uploaded on the International Music Scores Library project – troupes of tropes, truly! – , a lot must be mere speculation, imagination and elaboration from the ensemble, Sequentia. And after all, this music was written almost a millennium ago – ain’t many elderly people left in the retirement homes who can tell us how it was back then. So Sequentia’s rendition, with its sparse accompaniment of two viols, harp and organistrum (an ancient form of the hurdy-gurdy), often reduced to droning support, and its ethereal women’s voices interlacing in the stratosphere (oftentimes singing purely a cappella, sometimes purely solo, sometimes solo dialoguing with choir), sounds almost too “New Age” to be, if not true, at least entirely “authentic”. Not that it matters. One doesn’t need to decide if the CD should be filed under “Medevial” or “New Age”, if it bears any relation to the music as it may have sounded between the walls of the Rupertsberg Convent in the 12th Century (I doubt that you could hear the soft rumbles of car traffic back then – horse hooves would be more like it) or if it is a 20th century hoax. What counts is that it sounds ecstatic indeed, ethereal, heavenly. 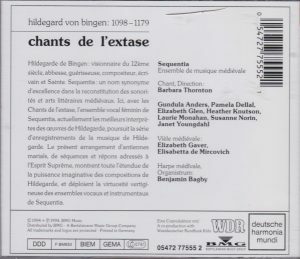 The Medieval music ensemble Sequentia, founded in 1977 by Benjamin Bagby and the much-lamented soprano Barbara Thornton (1950-1998), was essential in the rediscovery of the music of Hildegard, starting with their recording of Ordo Virtutum in 1982 (first CD release in 1987 on Deutsche Harmonia Mundi CDS 7 49249 8, barcode 077774924986). 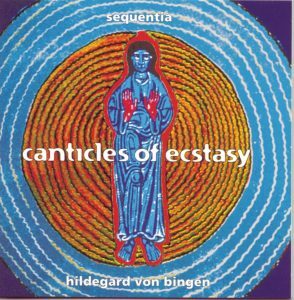 “Canticles of ecstasy” was their third installment in their exploration of Hildegard’s music, after “Symphoniae, Geistliche Gesänge”, recorded in 1983 and first-published on CD also in 1987, Deutsche Harmonia Mundi CDC 7 49251 2, barcode 077774925129. So far (2017), they are up to eight, including a 1998 remake of Ordo Virtutum – the last recording in which Thornton participated, DHM 05472 77394 2, barcode 0054727739422. 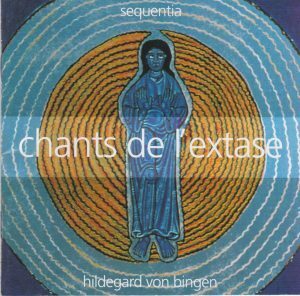 For more Hildegard by Sequentia and more recordings of Sequentia, see my Sequentia complete CD discography. A French edition of “Canticles of ecstasy”, “Chants de l’extase”, was released simultaneously, and it is the one I have. Content is no different than the English edition: liner notes come in the three languages, English (first), German, French, texts and translations are provided, paper quality is good, slightly plastified. I don’t have the English edition handy, but, in my experience of other Sequentia/DHM French vs English editions (Shining Light / Lumière), paper quality wasn’t so good. 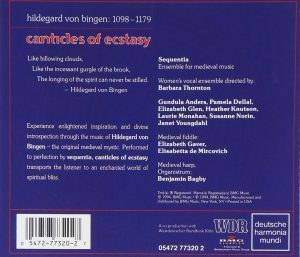 Hildegard called her works “Symphoniae harmoniae celestium revelationum”, which I’ve seen translated as “Symphonies of the Harmonies of Celestial Revelation”. Well, we don’t know either how the voices of the angels sound, but this is a good fantasy of them. If you want to drift away into the Big White Horizon, you might as well chose this disc to accompany you.